Cheaper By The Dozen opens at Lake City Playhouse this weekend. Every family has its own unique dynamic, but even by those standards the Gilbreths were an idiosyncratic bunch. Parents Frank Sr. and Lillian were prominent industrial time-and-motion efficiency experts during a period when efficiency was all the rage, and they brought their work home with them in an attempt to streamline domestic life. They were also an uncommonly large family, prompting Frank Sr. to joke that children came cheaper by the dozen. 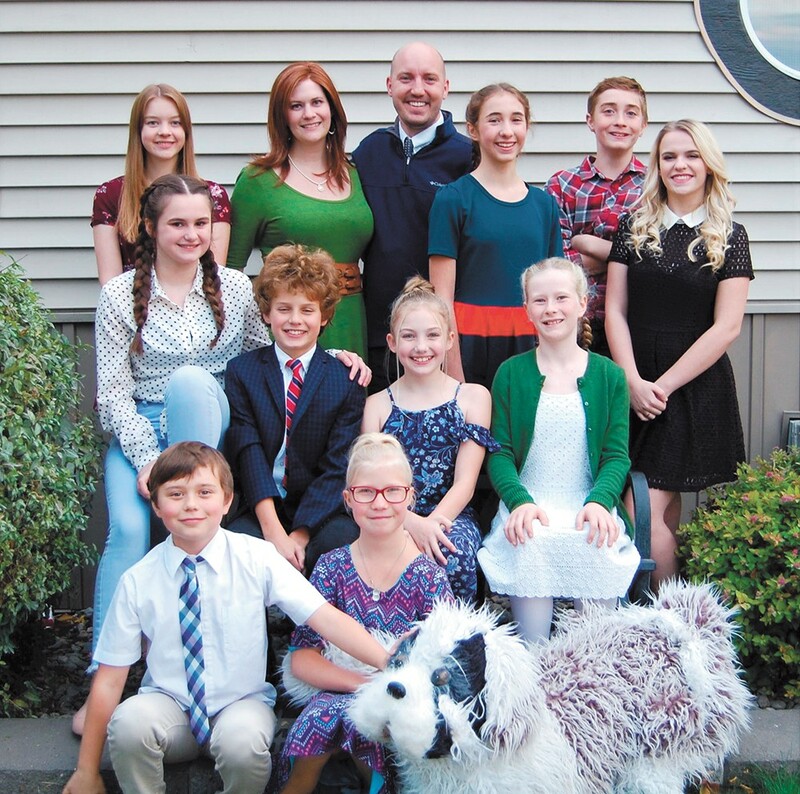 For its second show of the current season, Lake City Playhouse is staging the musical adaptation of the aptly named Cheaper by the Dozen, which first appeared in 1948 as a book co-written by two of the Gilbreth children. With a mix of humor and honesty, the musical chronicles how the family dynamic changes when Frank Sr. tries to impose his efficiency methods on his children, prompting the eldest daughters, Anne (played by Sydney Morgan) and Ernestine (Ashley Butterfield), to rebel. What makes this Cheaper by the Dozen even more of a family affair is that two real-life siblings, Katrina and Travis Cook, have two roles each in the show. Katrina appears as housekeeper Mrs. Fitzgerald and teacher Ms. Brill; Travis is Joe, the school cheerleader, and Anne's love interest, Larry. Maintaining the distinction between characters played by the same actor can be challenging, which is why Katrina is taking a slightly different approach to her roles than the musical might ordinarily call for. "The housekeeper ... helps keep the children in line. And then the teacher, she doesn't approve of the [home]schooling the kids are doing," she says. "Initially, I feel like the housekeeper was meant to be played a little bit more stern, but in order to give that good contrast between the two, we're trying to make the housekeeper a lot more integrated into the family. The more you're able to define each character separately, you're able to get into their mindset a little bit better." Travis, though playing characters who are close in age, has slightly less nuance to wrestle with. Joe, he says, is "very upbeat, almost hyper, but he's also not the smartest. That's how I'm kind of playing him. Whereas Larry, he's almost more reserved and more polite. He observes what's going on around him more." Cheaper by the Dozen marks Katrina's first time onstage since graduating high school in 2008. By day she works as a senior legal secretary, and she finds that she's able to draw on that professional experience in her performance. "In my job I work with a huge variety of people in the community, and so I feel like you can really use that experience to be able to relate to different characters within the show. You change your persona a little bit based on who you're talking to, whether it's a colleague or a superior or even a family member. That really translates," she says, "especially in a show where you do have a pretty good variety of cast. You have kids, teenagers and adults all in one show, all on the stage at one time." This also marks the first time Katrina has performed alongside her brother, whose first-ever role was as an Oompa Loompa in Charlie and the Chocolate Factory at Lake City when he was in fourth grade. Today he's a full-time student at North Idaho College and works part-time for Wish Upon a Star, a local live-character entertainment company. "I've wanted to do shows with her, but the way our ages worked out she was out of high school before I came in. Being in this show with her is awesome. It's also kind of challenging, too, because I've never had to do rehearsals with family members there. At first, it's a little weird, but it's really fun because we can give each other feedback at home when we're running lines," he says. "With the play being about family, it kind of gives me an appreciation for it. I see it as, time goes by really fast, and so you really want to spend more time with your family." Katrina agrees, adding that, for all its lighthearted humor, Cheaper by the Dozen's more poignant scenes remind viewers — as well as its cast —"that time is really precious." The original print version of this article was headlined "Family Matters"